Just like children, wounds are a normal part of a dog’s life. Their active life and jumping nature makes them vulnerable to physical damage. In addition, their aggression is also a reason behind getting skin cuts, wounds and lesions. For normal wounds, the treatment involves wound cleansing and applying wound repair creams while for severe wounds surgical help is the only solution. 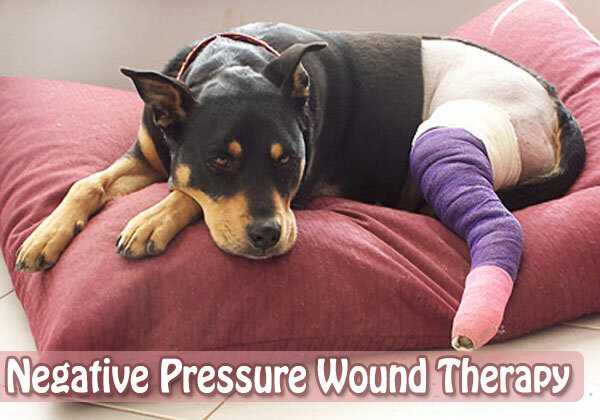 Negative Pressure Wound Therapy is another method of treating severe wounds in dogs. It has been used since a couple of years and has shown exceptional results. It is about healing the wound by sealing it in an airtight bandage and exposing the wound to vacuum for some time. This techno savvy method uses a specialized machine for generating negative pressure in the airtight space. When can one apply NPWT technique? When the open wound is very severe and demands instant debridement and granulation. For skin grafting to increase the viability of the graft. For wound repair of closed incisions to pace up the healing process. What are the benefits of NPWT? NPWT ensures faster recovery of severe wounds. It does so by pacing up the process of removing damaged cells, tissues and foreign objects from the wounded area. Its next step is to hasten up the granulation process. Granulation involves formation of new connective tissues and tiny blood vessels during the healing of the wound. NPWT gives very quick results. It takes nearly 72 hours for the technique to finish the debridement and granulation process. If the condition demands then one can use NPWT for another 48 or 72 hours. Apart from the faster results that NPWT gives, it is also very easy to change than traditional bandages. They are changed at 72 hours and make the entire process quite less labor intensive. It is suitable for all sizes of pets. Be it a puppy, small dog, adult dog or a large sized canine, NPWT is applicable to all. Use of this technique in veterinary medicine is increasing at a rocking pace. In the coming future, this technique can save so many lives or at least facilitate pets suffering from severe accidents and wounds. It would be revolutionary thing in veterinary medicine when practiced for wound repair of pets that have gone through rough accidents, canine attacks and other kinds of physical damage. This high tech method is surely going to be a rage in the coming future.